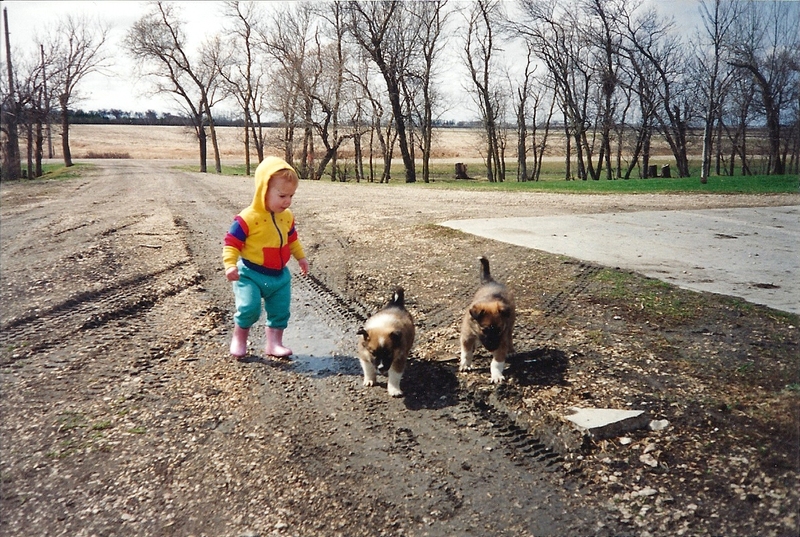 Me when I was about one and a half years old with our two puppies who have both passed on now. I am a country gal and not a girly one at that. I grew up on an acreage with lots of room to play. For me, I don’t think I could handle living in a city where I don’t have a yard.I have also had numerous dogs and cats and have always had at least one dog. We never chain up our animals either but rather let them run free but we also never take them inside. They are always outdoor pets. We don’t often have much traffic that goes by our place except during farming time. My dad used to be a farmer so when I was little, I would go for rides on the combine during harvest season as well as the grain trucks. I enjoyed looking for the mice that would try to scramble away from the combine. I grew up loving the smell of burning fields when farmers would burn the straw that was left after combining and I still love that smell. When my brothers and I were younger, we would sometimes sit outside and play while my dad played his banjo and sang. I grew up listening to country music with my dad and I love country music to this day. My dad, two of my brothers and I having a picnic on the field. At this time I was about 3 1/2 years old. 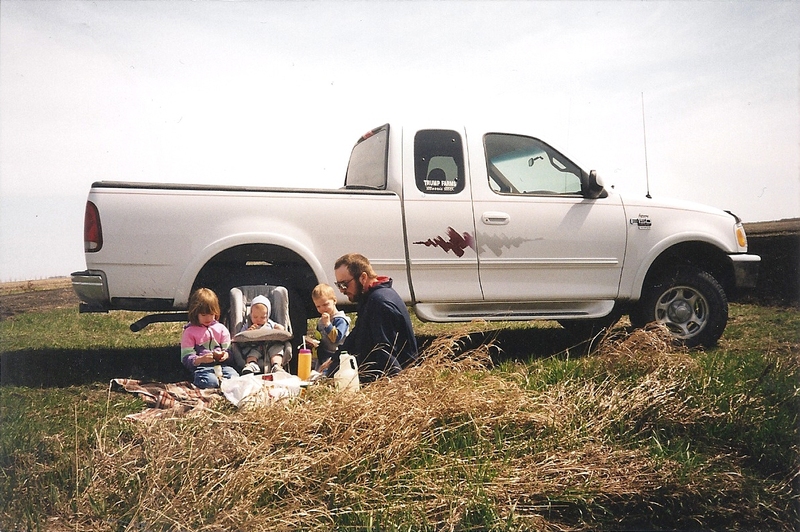 We used to have picnics on the tailgate of the truck while on the field. We would hope into our vehicle and my mom would take us to the field where we would eat picnic style as a family. I watched, fascinated as the grain would somehow make its way up the auger into the grain bin. As I got older, I was the one to bring food to those on the field as my mom helped with harvest. We live by a creek and our ditches merge into the creek. When we were younger and the ditches were swollen, we used to go swimming in them even though the water was really dirty but we didn’t mind at that age. However, the farming wasn’t the only thing I got to experience as a country girl. We also got to see lots of wildlife. Over my years of living in the country I’ve seen foxes, raccoons, skunks, deer, muskrats, various types of birds (I won’t name them because there would be too many and I don’t know the names of all of them), ducks, geese, beavers, mice, rats, all types of insects, squirrels, owls, hawks, rabbits, frogs, fish, worms, and there are probably others I haven’t mentioned. I have also heard coyotes but haven’t actually seen one and the past couple of weeks there was a bear in the bushes close to our place but I never actually saw the bear but my neighbor did and two of my neighbors saw evidence that it was there. It makes sense though because in the last couple of weeks we have seen quite a few deer on our side of the bushes; more so than usual so they were probably trying to stay away from the bear. Also, last week when I went for a walk in the morning, my dog was marking his territory every couple of meters which I thought was weird but didn’t know why he was doing it. I’m guessing he might have smelt that there was a bear or something and was marking his territory because of it. When my mom heard about the bear in the bushes, she told me not to walk through the bushes like I did last summer. I can’t tell you how many ticks I’ve had over the years either because I’m pretty sure I’ve had at least one every summer and when I was younger, I got a lot more because then I would sooner walk among the long grass we have in our backyard. I’m not scared of animals nor insects as is evident by some of the stories I have about my encounters with animals. 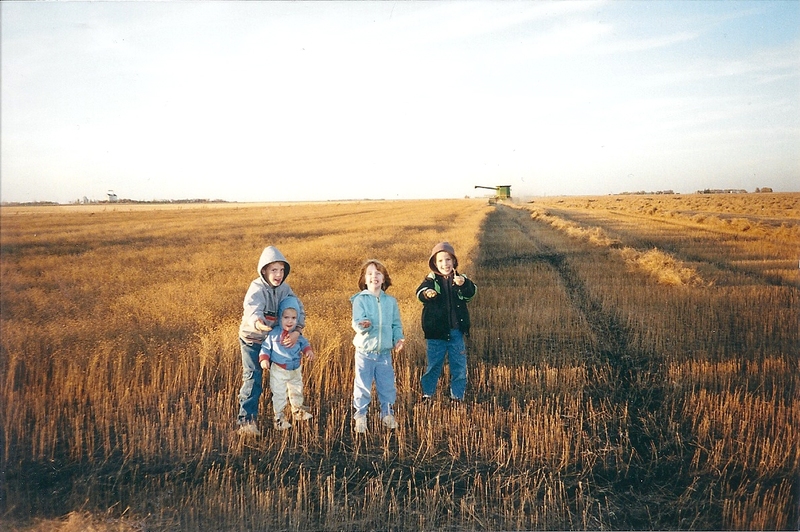 Three of my brothers and I standing in the field while my dad combines in the background. I would have been close to five years old at the time of this picture. When I was four years old, I saw a skunk close to our house and I went to pet it because I love animals. When I reached out my hand to pet it, it bit me and had to get rabies’ shots. I have scars on my fingers where it bit me. I also once tried to save a duckling because it was hurt or something and my dog was going to eat it. So I had my brothers help me distract our dog while I tried bringing the duckling away to the creek where it could swim away and hopefully escape my dog. I also enjoy killing some animals. I’ve killed mice and just the other day, I picked up a dead mouse to throw it in the bush with my bare hands. I also one time tried to “rescue” a mouse that was a window sill but he bit me so I left him there. I enjoy killing frogs by throwing them against concrete and if they still aren’t dead then I step on them. I kill flies with my bare hands. I don’t need a fly swatter. I also kill crickets in whatever way I can. We have also had infestations of some sort of beetle that looks kind of like lady bugs that usually just stay around our window sill. Those I often kill by putting them in a bowl filled with water and spray raid in the water. I also kind of like squishing ticks that are full of blood after plucking them off my dog because the blood squirts out. Yet, I often won’t kill spiders until they are bugging me or crawl on me which isn’t very often. They eat mosquitoes and mosquitoes try to eat me so I think I’ll let the spiders live. When I was younger, I also used to enjoy cutting earth worms and see how long they lived. As you can tell, I am not your average girl, and don’t call me a girly girl because I am not.